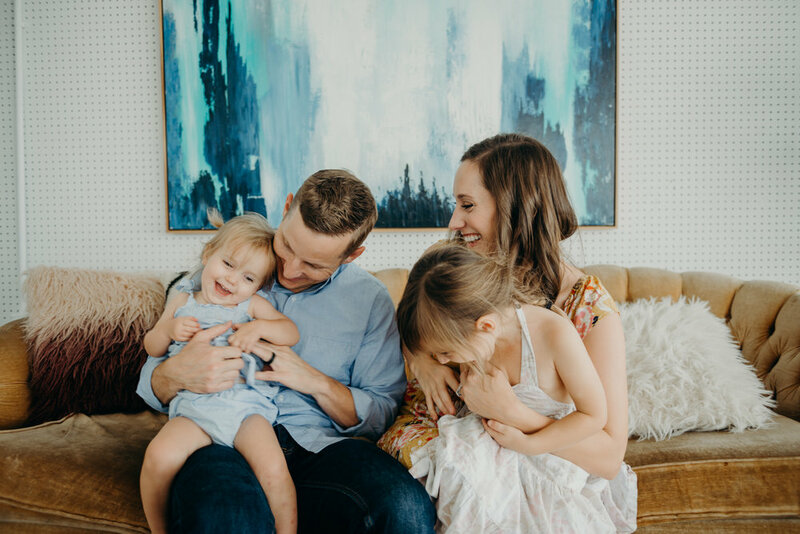 I'm the proud wife of Cory Haney (a global missions pastor) and the busy mommy of Norah Grace (4) and Lydia Rose (2). Growing up, I didn't ask my parents for Barbie dolls or princess dresses. Instead, I begged for blank cassette tapes so I could interview my friends on my large 90s boom box. Luckily, those tapes are lost. But, my passion for storytelling and interviewing continued to grow and led me to pursue my degree from one the top broadcast journalism schools in the country. After graduating from the University of Missouri in Columbia, I spent 10 years at the Christian Broadcasting Network as a producer and writer--getting to travel the country and interview the most fascinating people! I've produced over 200 Christian testimonies for the show seen in 96% of U.S. Markets and 138 countries. In 2017, I helped co-author a Bible Study for expecting parents called Your Newborn Promise Project with publisher Graham Blanchard. Though far from a parenting authority, my own clumsy and messy journey of becoming a mom made me realize that I had a passion for pouring into my fellow moms in the trenches and bringing them the encouragement I so desperately need every day. That's why I'm so excited to have you join me on The 5 Minute Mom Podcast. I had the idea to launch this podcast because (well, full disclosure) I could never seem to make it through a whole "grown up" episode without some kind of tiny person interruption. So, we are going to talk about real life, real faith, REAL fast. But first, a disclaimer. I'm a regular mom--just like you. I'm the mom that loves her kids something fierce, but is still a hot mess (like, I somehow always forget the diaper bag and my kids dress themselves like Punky Brewster most days). I have good days, bad days, and days that are a blur. Most of my time is spent wiping bottoms, filling up sippy cupys, and answering 4-year old questions like, "Can we get a unicorn for Christmas?" and "Will there be gluten free donuts in Heaven?" We cry, we laugh, we struggle, we sing, we fight, and we have epic dance parties. We are loud, we are crazy--but most importantly--we invite Jesus into our mess and messages. And I'm happy to invite you too.